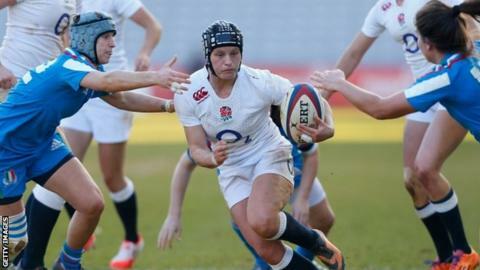 England women scored six tries as they defeated Italy 39-7 for their first win of the Six Nations campaign. World Cup-winning captain Katy Mclean scored a try and slotted four of her eight kicks at goal as she returned from Sevens duty. Alex Matthews, Abigail Scott, Ceri Large, Hannah Gallagher and Kay Wilson also touched down for the Red Roses. The Italians had taken the lead with a try from Flavia Severin, but the home side rallied in the second half. England were still not of the standard that won them the 2014 World Cup but the performance at Twickenham Stoop was an improvement on last week's 13-0 loss to Wales. Mclean, absent against Wales, opened the scoring by slotting a penalty after four minutes. England wasted countless attacking opportunities as the Italian defence frustrated the home team in the first 20 minutes. The Azzurris scored with their first run into English territory as captain Silvia Gaudino set up lock Severin for the first try of the match. Michela Sillari's conversion made it 7-3 to Italy, who lost to Ireland in their opening Six Nations match. England appeared shocked but responded quickly. Two tries followed within five minutes of each other as Richmond's Matthews scored England's first of the Six Nations campaign, followed by Darlington Mowden Park Sharks' Scott. Italy were reduced to 14 women in the second half as fly-half Beatrice Rigoni was sent to the sin-bin for persistent infringements at the breakdown. However, it took England the full 10 minutes to take advantage with Worcester's Ceri Large touching down the third try. England's fourth try caught the Italians napping as Mclean took a quick penalty to cross the whitewash and it was followed minutes later by a solo effort from Saracens flanker Gallagher. Thurrock full-back Wilson completed the English scoring efforts after touching down in the corner on the final whistle. "The Six Nations is wide open and we're going to Ireland next. We have to be more clinical because I think Ireland will be more dangerous. "The first half was frustrating but all credit to Italy, we had so much possession and we just didn't make enough clinical decisions. But it's a new squad (England), I've got about six caps less than the whole back line put together. "I don't think you can hide away from that fact that these girls are going on to play in the next World Cup, but that's in three years time and this is a massive learning curve." England travel to Ireland in their next fixture in two weeks, while Italy are away to Scotland. England: Wilson, Laybourn, Brown, Large, Gregson, Mclean, Blackburn; Clark, Fleetwood, Keates, Taylor (captain), Scott, Matthews, Gallagher, Millar-Mills. Replacements: Cokayne, Cornborough, Lucas, Burnfield, Field, Davidson, Goddard, McKenna.